The book takes its title from Amilcar Cabral’s 1969 reference to Algiers as an interconnected place (p. 3) and alludes to travels of figureheads such as Nelson Mandela or Che Guevara but also to the journeys of all sorts of left-leaning people (nicknamed pieds rouge (p. 5)) from around the globe who were fascinated by the laboratory of the Algerian revolution. This metaphor adequately sets the scene for the focus of this book. 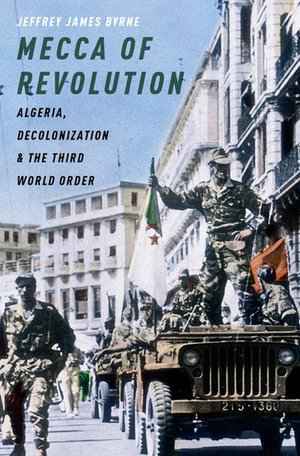 Byrne fruitfully discusses Algeria’s role regarding decolonization, the third world political project, non-alignment, the Afro-Asian, pan-African, pan-Arab and Maghrib unity movements, and thereby weaves a fascinating and detailed account of Algeria’s revolution and its aftermath in a globalized context. This is a timely contribution to growing scholarship on the Third World’s Cold War and firmly places Algeria on the map of key thinkers of Third Worldism as political movement and important actor in the Afro-Asian and non-aligned movements. Moreover, it perceptively traces the tensions that Algerian politicians faced navigating an increasingly narrow road between competing forms of globalization, a socialist and a capitalist system. Mecca of Revolution starts and ends with the coup d’état of June 1965 that disposed President Ahmed Ben Bella (whom the author interviewed personally). The coup took place in June 1965 just before international delegates convened for the Second Summit of Afro-Asian Heads of State, known as Bandung II. As a result of the insecurities after the coup the conference which would have cemented Algeria’s status as “guiding force in Third World Affairs” (p. 3) never took place. The dream which many in the 1960s’ international left dreamed—that morally superior third world peasants, workers and revolutionaries would lead the path through internationalist solidarity to a better future marked by anticolonialism, world peace and global economic equality—seems to have equally vanished. In five substantive chapters Mecca of Revolution takes the reader on a journey from the beginning of the Algerian war of independence from France to the fall of the first post-colonial regime. The introduction and conclusion skillfully bring the three main levels of analysis together. First, the focus lies on the national history of decolonization from France, tracking how guerilla fighters became statesmen and what role revolutionary ideas and methods played. Second, the relations of the FLN liberation movement and the Algerian state with the Global North, both East and West are scrutinized and placed in the framework of a multipolar Cold War. Lastly, Byrne offers new insights into Third World politics and South-South relations from Bandung I until Bandung II. Byrne’s impressive use of multilingual archival material from Algeria, France, Great Britain, Serbia, the United States and various international organizations attests to the global scope of this work and the author’s skill of interweaving very different geographic and historical contexts. Algeria’s richness of state-archives for the post-colonial period is noteworthy. However, one of the book’s main arguments about the centrality of the state as outcome of post-colonial Third Worldism might, at least partially, reflect the use of state-centric archives, prominently among them the foreign ministry of the GPRA (pp. 9-10). One wonders how the story would differ through the lens of a social history focus. Byrne’s work brings together political analysis with anecdotes, for instance of President Gamal Abdel Nasser’s visit to Algiers in May 1963 who had to flee the jubilant masses on top of a fire engine (p. 183) and memorable quotations by Franz Fanon and key political players from Ben Bella, Kennedy, Tito, Lumumba, Nkrumah, and Zhou Enlai, to Khrushchev to weave an engaging chronological and thematic narrative. The book introduces a well-timed focus on Algeria’s central role in Third World politics and knowledgeably interweaves national history with global history. In so doing Byrne follows in the footsteps of his thesis advisor Odd Arne Westad’s key book The Global Cold War: Third World Interventions and the Making of Our Times, and acknowledges the influence of Matthew Connelly’s A Diplomatic Revolution: Algeria’s Fight for Independence and the Origins of the Post-Cold War Era. Byrne, however, shifts the temporal focus beyond independence in 1962. From the chosen cut-off point, the 1965 coup, one could wrongfully deduce that Algeria’s political involvement in the Third World ended with Ben Bella’s fall from power, yet Algeria continued to support liberation movements; Boumediene was Chairman of the Organization of African Unity (1968-1969), and Secretary General of the Non-Aligned Movement (1973-1976). This book further differs from existing literature through its focus on South-South relations, which allows to analyze decolonization not only with a view to recalibrating the relationship with the former colonizer and key players in the Global North but with regard to defining a shared political Third World project. Byrne has written a fascinating account of key actors in Algerian politics and their counterparts abroad and in so doing has produced an excellent account of international history with a double focus on diplomacy and revolutionary nation building. It could have been an even more refined analysis if more attention had been placed on a critical reading of gender and race. The role of women in the Algerian revolution is only mentioned in passing (pp. 46, 279) and the reader is left to wonder what effect the almost total exclusion of women as actors in (Algerian) political discourse regarding the Third World, Non-Aligned and Afro-Asian movements had and reversely what role differing conceptions of masculinity played in diplomacy at conferences, in closed-door meetings between high-ranking government officials, and on the ground. Similarly, when politics of race feature (e.g. pp. 172, 200, 213) the author takes for granted the historic actors’ categories from the global South. Critically analyzing the various racialized discourses of Algeria’s role in Africa and China’s role in the Afro-Asian movement in the historic context of decolonization might have led to new insights about race and the Cold War. This work is of special interest to scholars of African history and the Maghreb region as well as to scholars interested in Third Worldism and the Cold War politics of the non-aligned movement. Byrne’s style of writing is engaging but presumes background knowledge, especially in the first two chapters on Algerian history, which is why graduate students will benefit more from this read than undergraduate students. This book with its emphasis on how the Third World looked and was envisioned from Algiers (and the respective places of exile of FNL politicians during the war for independence) can be read fruitfully side by side with Christoph Kalter’s excellent examination of the role the Third World played as concept (as opposed to an analytical category of sphere of reality) for France’s New Left during the 1960s . All in all, Byrne is to be applauded for an excellent book that provides food for thought on how the Third Worldist legacies of the 1960s and 1970s continue to shape the twenty first-century. After all, “the postcolonial world is our world” (p. 13). Christoph Kalter, The Discovery of the Third World: Decolonization and the Rise of the New Left in France, c. 1950-1976, Cambridge 2016. Marcia C. Schenck: Rezension zu: Byrne, Jeffrey James: Mecca of Revolution. Algeria, Decolonization, and the Third World Order. Oxford 2016 , in: Connections. A Journal for Historians and Area Specialists, 20.10.2018, <www.connections.clio-online.net/publicationreview/id/rezbuecher-29062>.